From cleaning out your garage or basement, to moving, we have you covered! Check out our "internet specials", which are geared for this type of project. Having work done on your home? 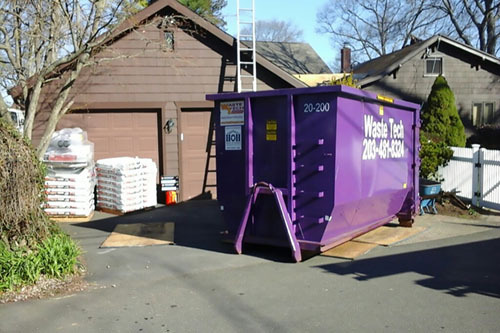 Ask your contractor to get one of our great purple dumpsters. When looking at our prices, we recommend our "standard rentals". They are a much better value than our "internet specials" when it comes to heavier materials such as construction & remodeling debris. Do you have rental properties and your tenants left behind a mess? Perhaps your company specializes in foreclosure clean-outs. 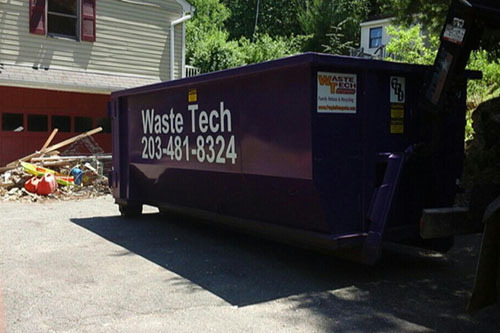 Our "Internet Special" dumpster rentals are ideal for these jobs. You get the space you need, without paying for extra weight/tonnage and rental time that you don't need. Building your dream home? Maybe you are adding on to your existing structure? Let Waste Tech help! 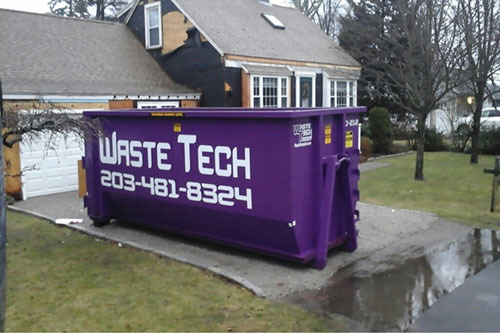 Order our beautiful purple dumpsters, or make sure your contractor knows that you prefer Waste Tech! When looking at our prices, we recommend our "standard rentals". They are a much better value than our "internet specials" when it comes to heavier materials such as construction debris. If you own a home, eventually the roof will have to be replaced. 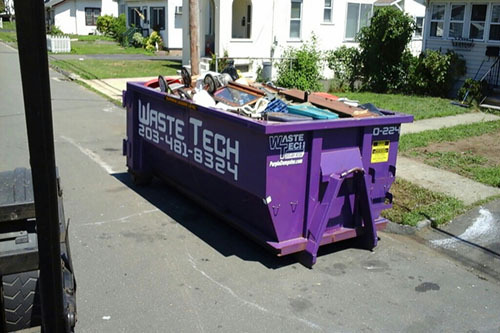 Make sure you hire a reputable company, and make sure they use a purple dumpster! When looking at our prices, we recommend our "standard rentals". They are a much better value than our "internet specials" when it comes to heavier materials such as roofing shingles. Does your business require dumpsters to remain on site and be dumped weekly or bi-weekly? We've got you covered! Affordable rates & generous rental periods are available. 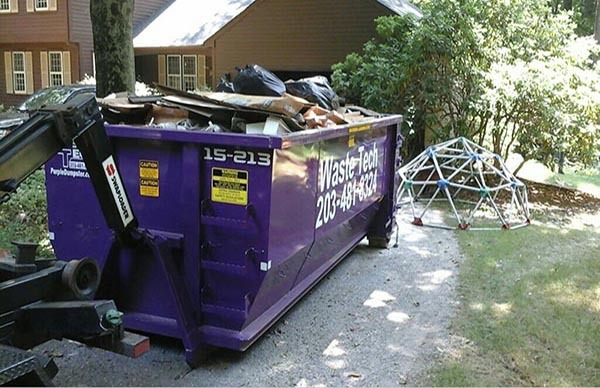 Dumpster rentals for commercial clean-outs. Get rid of that old furniture and junk. Streamline your office! Service within 1 business day is our standard, with same day service often available. Take back your yard! Don't let mother nature reclaim your land! Ask about our flat rate dumpsters for brush/green materials. Only available in certain towns. Have a large amount of concrete, stone, dirt or asphalt? Don't waste money and pay by the ton! Ask about our flat rate containers for this type of material. Only available in certain towns. 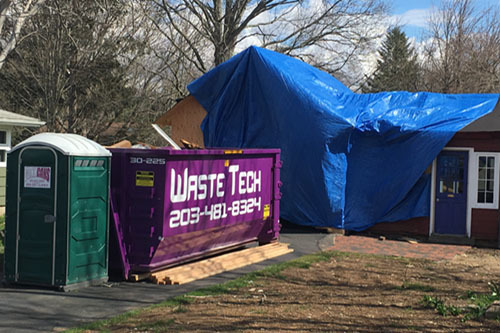 From spring cleaning to moving, our dumpsters work great for residential jobs. Reclaim that basement or garage from years of junk. 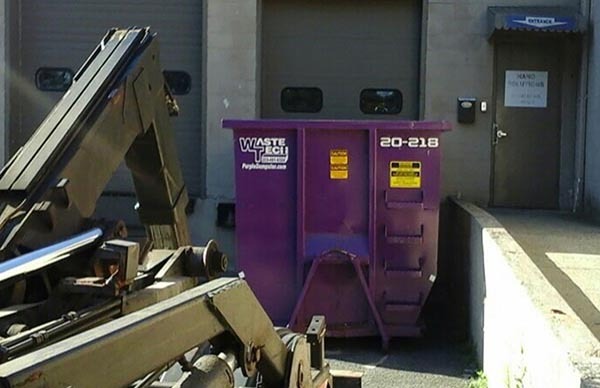 Our dumpster rental specials start at just $249.00. Building your dream home? 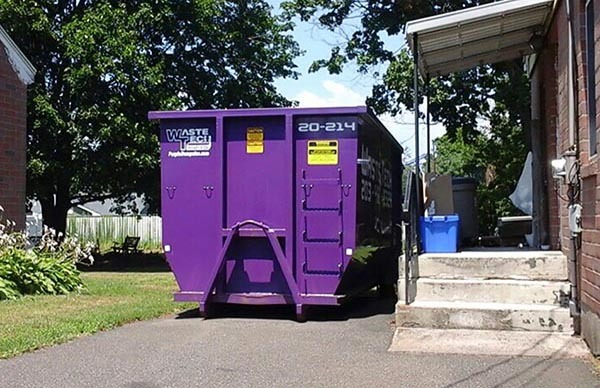 Let your builder know you want one of our awesome purple dumpsters on the job. Our reliable service and competitive pricing will keep your contractor happy, which means you get into your new home on time! Have an office full of aging furniture and outdated equipment? 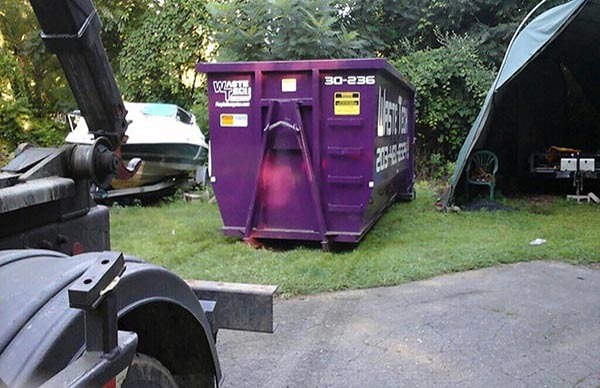 Our dumpster rentals are an affordable option to declutter that space and make your business operate more efficiently. Have a backyard that is out of control? Tame that animal and rent a dumpster for yard debris and/or trees. Affordable, flat rate dumpsters are available if you can keep it "green". 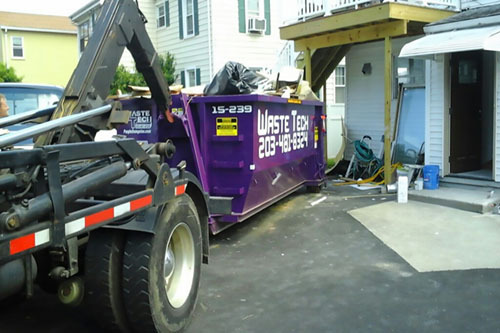 Does your business need a dumpster kept on site and dumped on a regular basis? If so, we can help. We have affordable monthly and bi-monthly rates for roll-off containers. From concrete sidewalks and walkways, to asphalt parking lots. 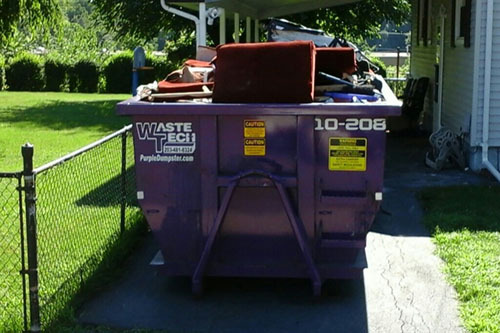 Waste Tech offers flat rate dumpsters for heavier debris, provided you keep it clean of other garbage/materials. Limited to local towns only. Need a dumpster for your carnival or fair? 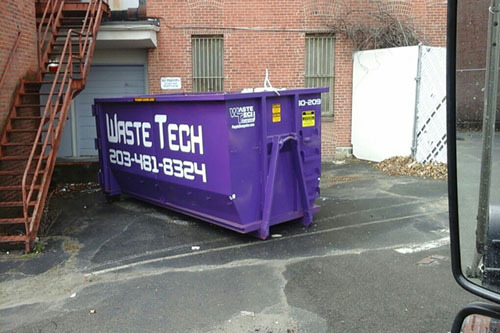 Make it easier on your staff by having a beautiful purple dumpster on site. 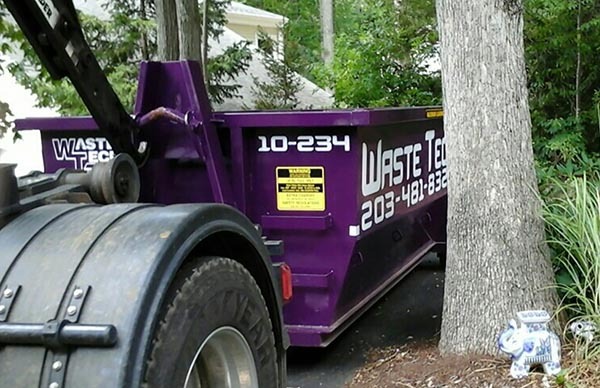 Waste Tech Family Refuse is a locally owned, family operated refuse and recycling company. Our mission is quite simple, to provide great service at a competitive price.